March 2019 Update: Clash of Clans is now updated to version 11.446.11. August 13, 2018: Clash of Clans has been updated to version 10.322.24. Clash of Clans, which is the best multi-player battle game in Android platform, developed by Supercell, is free to download and play, though it has some in-app purchases that help to buy gems that speed up the gameplay. You can download the latest version of Clash of Clans from the link provided below. We update the APK file as soon as the developer pushes a new update. The file provided below is untouched and unmodified, so you don’t have to worry about the authentication of the file. Recently, Supercell has released a new game, Clash Royale, which already has become popular among Android and iOS users. But still Clash of Clans is the daily driver for many players, and they love to spend most of the time in the game. 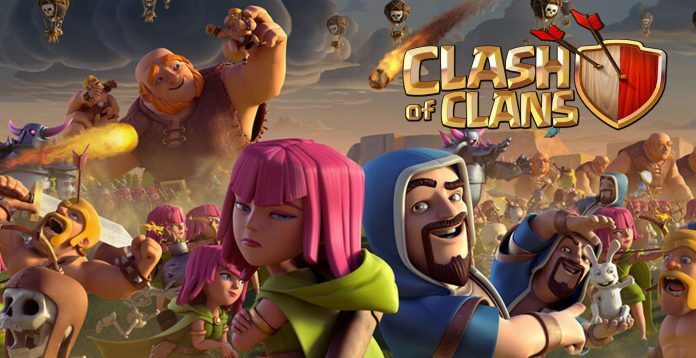 The game becomes very addictive after you join a clan and participate in clan wars. A clan is a community where you and other members can chat and donate troops to each other, with a single motive to win wars against other Clans. There are total 12 Town Hall levels in the game as of now, but it may further increase in upcoming updates with the introduction of few more Heros and dark troops. Currently there many interesting troops in the game like, Witch, Lava Hound, Golem, Dragons, Hog, etc. that makes the game fascinating. Besides, some spells may increase the efficiency of the troops in raids and war. Overall, one might fall for the game within a week and may become an addictive player of Clash of Clans. In the game, you have to build your village and army. It is a complete strategy game, and you have to choose your village layout and army composition so that you can win over others. Please note that you need an active internet connection to play this game and in no way, you can play this game offline. You can download the latest version of Clash of Clans from the link provided above. To get more updates on COC, stay tuned with us and follow us on social network websites. Yep its very nice game..
apk downloads fine but when you open it, the bar fully loads and then the game force closes. Here getting problem on updating… Even not updating APK. Why?